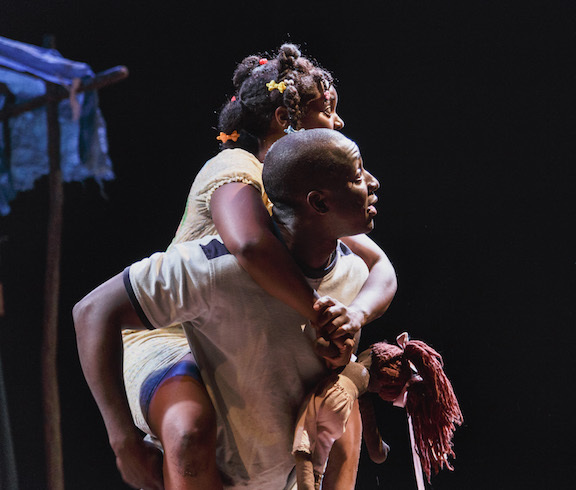 Playwright Jeff Augustin’s compelling play on the lives of restavek children, The Last Tiger in Haiti, opened at the Peets Theater in the Berkeley Rep Theater complex this past weekend. Restavek, from the expression restez avec, is the Haitian practice of selling children under the age of 18 into a form of indentured servitude. Often from desperately poor families, they work for others who are only slightly more moneyed and often abusive. An illegal practice, restavek continues in Haiti to this day, a feature of the country’s poverty and the government’s continuing policy of exploitation. The play opens in the stark shadow of a shack. A tall young man enters and digs in the sand, but he cannot find what he thought was buried there. He frantically searches around him. The lights dim and come up again on the young girl Rose (Brittany Bellizeare) playing with her doll. A pair of young men enters, bantering. But their attention soon turns to the young girl and one of them, Joseph, grabs her doll. It’s a familiar moment, a small episode of cruelty between children. The first young man, Max (Andy Lucien), reenters. He is the oldest, the most developed, the one who is most clearly a man. He retrieves the doll and insists that Joseph (Reggie E. White) tell them a story. Krak! he insists. Krik! Joseph says, and the others reply Krak! Krik is the term used by the Haitian storyteller to signify to others that he is ready to speak, to weave a story that will transport the listeners to another place, another time. Krak! replies the listeners, indicating they are ready to hear, ready to be swept into the storyteller’s moment. The tale Joseph tells is mythologic, a creation tale that is an evocation of rice, okra and plantains, the foodstuff of his life. He delivers it with the fervor of the famished, and his listeners are rapt, enthralled by the magic of divine provision. So too are the audience. The four squabble over who will tell the next story: Max, who the girl Rose thinks is the best storyteller of all, or Emmanuel (Clinton Roane), who no one thinks is very good. As the play continues storytelling becomes the focus of the play, and each tale takes a step closer into the dark despair of these children who are doomed to servitude. But at the same time the stories become a solution: a means for them to objectify and place the pain of their lives outside themselves. An especially lovely moment is Laurie’s story. A young woman, reckless but fearful of her Mistah and Missus, Laurie (Jasmine St. Clair) returns to the camp after celebrating a forbidden carnival. To quiet the others’ fears she tells Rose her favorite story about The Girl and The Orange. In this story a young serving girl eats the oranges her mistress has left on the table. Running from the raging Missus, she goes to the orange tree in the middle of the river and sings to it, telling the orange of her dilemma and asking to be saved. St. Clair uses her light, pure soprano to sing Laurie’s story, and she is joined by the others in quiet a cappella harmony. The second act, which is between Rose and Max, takes place some 15 years later in Florida. Things are revealed that could not have been imagined in the story that took place in the first act. No spoilers here. Just go, find out what happens, you won’t regret it. The acting is first rate. The play thought provoking. The Last Tiger in Haiti was directed by Joshua Kahan Brody, with scenic design by Takeshi Kata and costumes by Dede Ayite. Lighting design by Alexander Nichols. Chantal Jean-Pierre did a fantastic job as dialect coach. The Last Tiger in Haiti continues at the Berkeley Rep through November 27. For information and tickets, visit www.berkeleyrep.org. Photo: Brittany Bellizeare (Rose) and Andy Lucien (Max) in The Last Tiger in Haiti at Berkeley Rep. Photo by Jim Carmody.